Recognized as one of the most significant discoveries within the field of environmental acoustics, micro-perforated sound absorption introduced the groundbreaking potential for a more precise and effective type of acoustic panel. The MicroPerfection® technology incorporated into every SoundPly acoustic panel, plank, baffle and beam represents the first time the full potential of micro-perforations has been available in an architectural commercial product. MicroPerfection® is the patent-pending technology behind the exceptional resonant sound absorption of SoundPly acoustic panels. Combining years of exhaustive research and development with cutting-edge manufacturing innovations, MicroPerfection generates up to 5 times the resonant absorption of other micro-perforated panels. During the development of MicroPerfection, considerable research was spent determining the reasons why micro-perforations used in other manufacturer’s architectural acoustic panels performed so far below expectations. Three key reasons were identified and specifically addressed with MicroPerfection. 1. THE QUALITY OF THE MICRO-PERFORATIONS. The benefits of our proprietary broach pin punch process include clean, sharp holes, helping to avoid the “punch craters”, veneer tear-out, and rounded, light-reflecting edges synonymous with other manufacturing methods. To facilitate optimal resonant sound absorption, a micro-perforation’s passage must have smooth walls with clean, sharp edges. These conditions allow the air inside each passage to move en masse, resonating quickly and efficiently in response to the frequencies of the interacting sound waves. Most micro-perforated panels (MPPs) are manufactured using a punch perforating machine intended for soft materials such as fabric and leather, not hard surfaces such as wood. The punching process crushes wood, leaving crudely formed holes with fractured and collapsed passages that restrict airflow. It’s a process equivalent to using a hammer to core an apple­­—it’s one to do it, but definitely not ideal. MicroPerfection technology employs a far better process. Using a sequence of broaching pins to create and refine each micro-perforation, SoundPly panels are produced with the cleanest, sharpest micro-perforations possible. 2. THE FUNCTIONAL PERCENTAGE OF MICRO-PERFORATIONS. Apart from SoundPly, every other micro-perforated acoustic panel on the market is constructed with drilled MDF or particleboard core, which completely blocks a majority of the the panel’s micro-perforations. Less than 34% of other manufacturers’ micro-perforations are functional. SoundPly panels are constructed with a process developed specifically to ensure that all micro-perforations are clean and completely unobstructed. 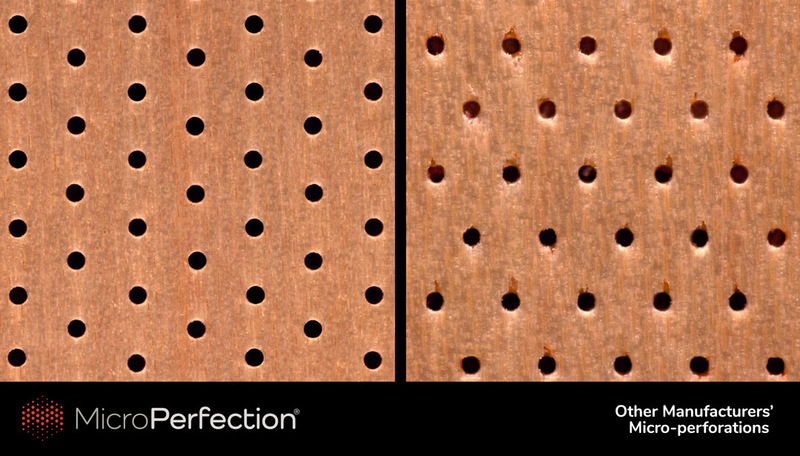 100% of SoundPly’s manufacturers’ micro-perforations are functional. 3. THE DIMENSIONS OF THE MICRO-PERFORATIONS. The image above is an actual cross-section of the micro-perforated skin of Navy Island’s SoundPly, compared to the micro-perforated skin of RPG’s Perfecto® micro-perforated panels. Seeking to improve the acoustic performance of existing MPPs, Navy Island tested numerous micro-perforations displaying variations of these four different dimensions. Through this process, Navy Island was able to “tune” the micro-perforations, achieving the broadest range of sound absorption across the most relevant frequencies. The tests revealed the ideal micro-perforation dimensions: a diameter of .45-.55mm at a depth of 1.8-2.1mm, spaced 2.5mm apart. Due to manufacturing limitations, other MPPs are produced with micro-perforations no deeper than .9mm, and many with depths shallower than .5mm. During testing, Navy Island measured the performance of micro-perforations with those depths and, when compared to a depth of 1.8mm, the differences were measurable. In overall sound absorption, micro-perforations with depths of .9mm and .5mm performed 28% and 45% poorer. Although they require a more exacting manufacturing process, SoundPly’s clean, deep and unobstructed micro-perforations provide unmatched acoustic performance. This is a principle reason why SoundPly panels are over 50% more sound absorbent than other micro-perforated panels.